I have brought a living thing into my house... and I'll do my best to keep it alive. I am the proud owner of my very first house-plant. It's not just a plant, it's a beautiful, red and green giant Christmas plant. It may be weird that I moved almost a year and a half ago and have never had a real plant. Truth is, my house is where plants go to die. I am the anti-plant person (not willingly) and I may have "cursed" myself when I was 12 or 13 years old. I remember the snow had just melted and spring was on its way. Everything in our garden looked brown and grey because of the harsh, cold months that had just passed. It was a mess that had to be cleaned so my father had told me to pull out anything that looked like weeds. I put on my fancy gardening gear (AKA old clothes and rubber, yellow kitchen gloves) and started pulling. Perhaps an hour later, I went back inside, full of dirt and proud of my work. The garden looked so clean. Well... I found out later that not only had I pulled out all the weeds, I had also pulled out every single flower and herb from its roots. All those beautiful, colorful flowers and fragrant herbs that would magically grow every year would never make a comeback. In my defense, I was young and everything was brown. How was I supposed to know? This past summer, I saw my neighbour with HUGE, marvelous basil plants on her balcony. I absolutely love basil and wanted in on the action. Ever since my herb and flower pulling frenzy, it may have been the first time I attempted gardening. I remained optimistic and thought if my neighbour can do it, I can do it too. I went to the market and got the biggest, most beautiful basil pot I could find. With such excitement, I put it on my balcony and tended to it to the best of my abilities. I got tips from the person who sold me the plant, read articles on how often I should water it and really did my best to make it grow. My fantasies of having an almost unlimited supply of basil were growing but my plant didn't grow at all. Within a few weeks, it was already wilting and I had to chop it all up. 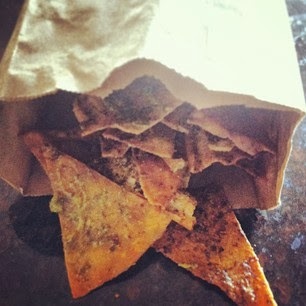 It ended up being the star in very delicious Pesto Pita Chips! 1. Combine the basil and garlic cloves in a food processor and pulse until coarsely chopped. Add 1/2 cup of the oil and process until fully incorporated and smooth. Season with salt and pepper. 2.1 If using immediately, add all the remaining oil and pulse until smooth and mix in the cheese. 2.2 If freezing, transfer to an air-tight container and drizzle remaining oil over the top. Freeze for up to 3 months. Thaw and stir in grated cheese before you eat. 3. Split pita bread into two rounds. Spread with pesto and sprinkle with cheese. Cut into wedges. 4. Place on an ungreased baking sheet. Bake at 350F for 10-12 minutes or until crisp.